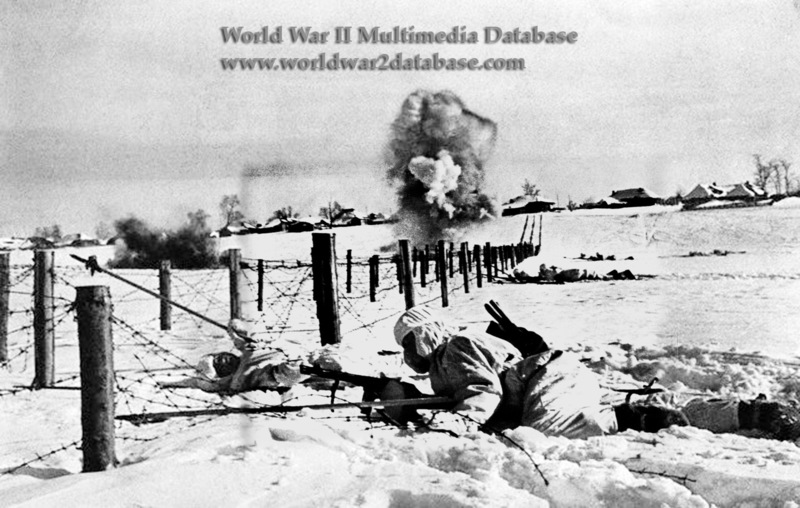 Soviet sappers (combat engineers) cut through German barbed wire. The two men in the foreground carry poles to probe for mines; one is armed with a PPSh-41 submachine gun. In the encirclement battles of Fall 1941, the Red Army lost most of their trained sappers. As a result, the Gosudarstvennyj Komitet Oborony ("State Defense Committee" or GKO, headed by Soviet Premier Josef Stalin) ordered Narodny Komissariat Oborony ("People's Commissariat (Ministry) of Defense" or NKO) to form ten sapper armies. These units were made up of both trained civilians who had engineering experience and raw conscripts, under Narodnyy Komissariat Vnutrennikh Del ("People's Commissariat of Internal Affairs" or NKVD) control. By December 1941, ten armies, totaling 300,000 men, were assembled, often without heavy equipment. Even as they were being formed, these units were immediately directed in November 1941 to begin building fortifications around Moscow. Two battalions of the 1st Sapper Army's 37th Sapper Brigade, designed 1st Guards Brigade (Miners) were trained in small unit operations for work behind German lines under direct Stavka (Supreme High Command) control. Lacking combat training and heavy equipment, the ten sapper armies were able to build many bunkers, but were unwieldy as a combat formation. Three were disbanded in February 1942 to form new rifle divisions, while the others were broken into smaller units and assigned to Fronts (Army Groups). The photographer, Oleg Knorring, traveled with correspondents Vasily Grossman and Ilya Ehrenburg during the war, whose reports from the front were very popular with the Soviet people. The three reporters barely escaped from the Ukraine before Kiev fell in October 1941; Knorring had almost no military training as he followed the war in its early days.